Do you remember 1966 – our centenary of our founding by Mary MacKillop and Julian Tenison Woods? 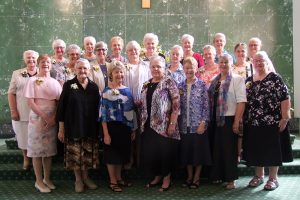 We – the 2019 Golden Jubilarians began our journey into Josephite life at Hunters Hill – 66 of us from Australia, New Zealand and Ireland. 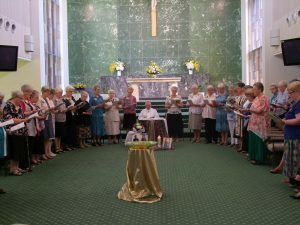 On 2 January 2019 we gathered at Baulkham Hills to celebrate the 50 Years of our journey as Professed Sisters of Saint Joseph. Our number of 21 was enriched by the presence of Mary O’Dea from Goulburn and from Perthville Mary Comer, known to us from her years at Xavier Institute and Training College in our earlier days. Unfortunately, Yvonne Tobin from the Sisters of Perpetual Adoration was unable to join us. On arrival at Baulkham Hills joy and excitement overflowed as we connected and shared many stories of our 5 years together in formation, the memories of Mary O’Dea and Mary Comer, as well as the fusions of our Congregations. Jubilee is a time to remember, a time to celebrate and a time to imagine a different tomorrow. …were a great introduction to our celebrations and time together. We are grateful to Monica, Maryellen and Catherine Shelton for their presence and time spent with us. We celebrated our Jubilee Eucharist and dinner on 4 January with many friends, family members, past formators and Congregational and Regional Leaders. Fr Dennis Crameri, the brother of Kath Crameri, was our Eucharistic celebrant and we were grateful for his encouraging us to have an inclusive and participatory liturgy. Another highlight of our time together was on 6 January when women who had been part of our journey joined us for dinner and Eucharist with Fr Tom Gleeson from South Australia. Colleen Lenord had come from California to be with us for these days and we appreciated her musical accompaniment for our celebrations. Again, we had a wonderful time sharing memories as we continue to share our Josephite spirit and companionship. The staff from Mary Mackillop Place for their assisting at the Jubilee dinner for us and our guests. in the beauty of human life. Touched by your hand, our world is holy.